Today is the twelfth anniversary of my youngest goddaughter Luci’s birth. From the minute I met this person as a pie-eyed, very round infant, she possessed the ability to meet people where they are and smile them into an exchanged joy; when she was a toddler, she did so wearing only a diaper and very muddy ladybug boots. Yesterday—the day before her birthday, mind you—I received a tiny envelope. In it was a rainbow pendant of Mother Mary. “I knew how much you love Mary,” she’d printed. 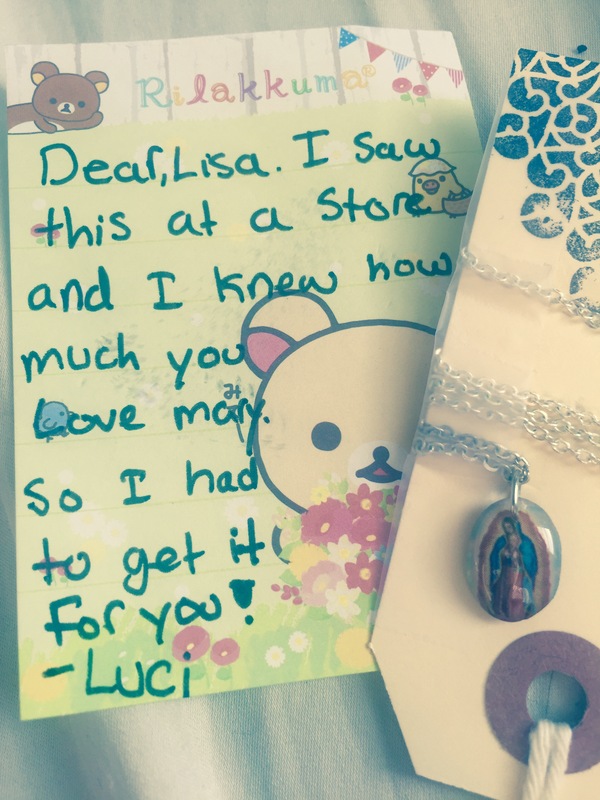 “So I had to get it!” That she sent it at all was lovely; that she instinctively sent it during Mother Mary’s month is just amazing. I am grateful for many things in my life but being a godmother to this star flower and her sister-star Delia is high on that list; ditto for their mother Melina, my partner-in-crime since first grade. Chosen family is a miraculous thing, and so is peony-scented love.